It’s what many of us have been waiting for ever since Hamburger SV dropped from Bundesliga 1. 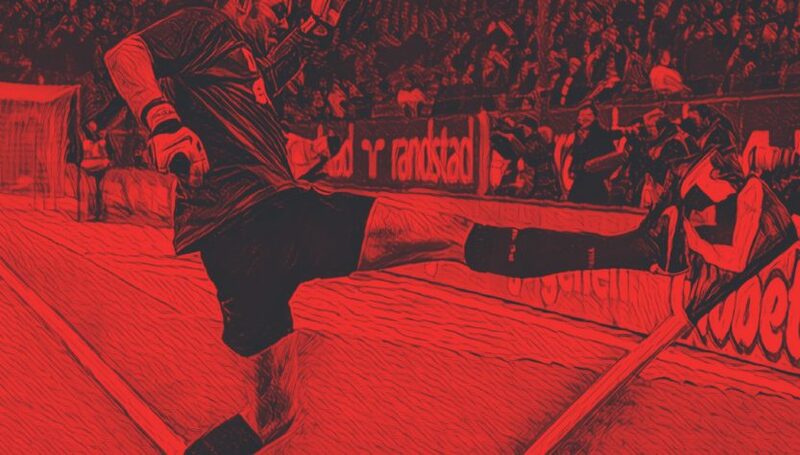 The derby! 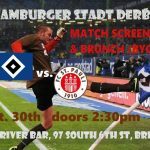 The contrast and history between FC St. Pauli and HSV is palpable to say the least, and the excitement for this historic match is felt all the way over in the NordAmerikurve. And we will be gathering all over the continent to watch on September 30, cheering on The Boys in Brown to victory. The East River Pirates will be gathering at the East River Bar at 2:30 for the match screening and brunch (BYOF). Bloody Marys aka Mexikaners will be flowing. The capital city will be rising at the crack of dawn to watch the live feed at Hometown Sports, 1525 Bank Street. Ohio like Ottawa will be rising early for the live FS1 feed (Thanks Ian Paul Joy) at McClellan’s Pub in Columbus. Yet another Supporters club rising for the live broadcast on Fox Sports 1 at 7:30. 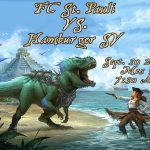 Join the gang at Mes Que as usual and welcome HSV to the hell of Bundesliga 2. Wednesday’s match against SV Paderborn will be shown after the HSV-FCSP match. Like NYC, Toronto folks will be sleeping in a bit, watching the match tape delayed at 2:00pm at The Dock Ellis. 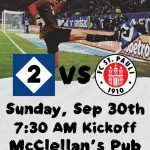 Toronto will also be doing some raffles for great FCSP swag, all for their charity Newcomer Kitchen. So if you are in any of these great communities and want to take in this epic match, join us.